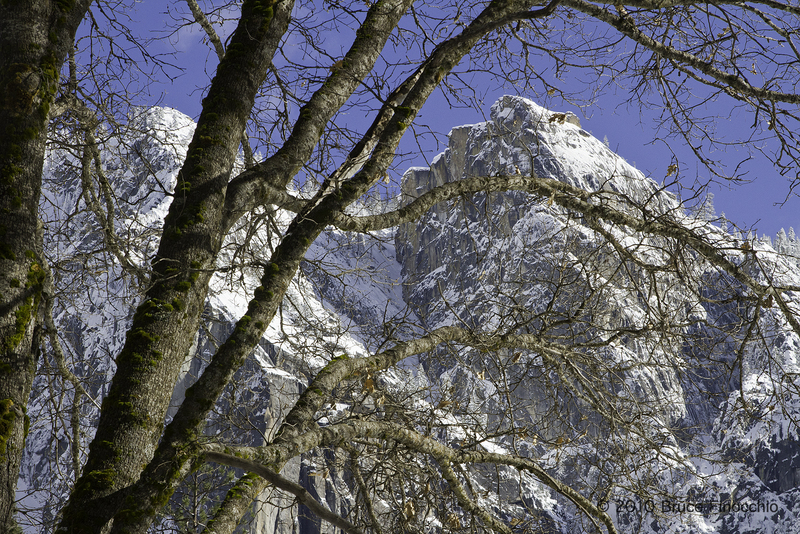 Photography is about seeing, identifying, and capturing a subject out of the chaos of ordinary visual clutter… Here in Yosemite I was trying to be different, and not just take the iconic shot. 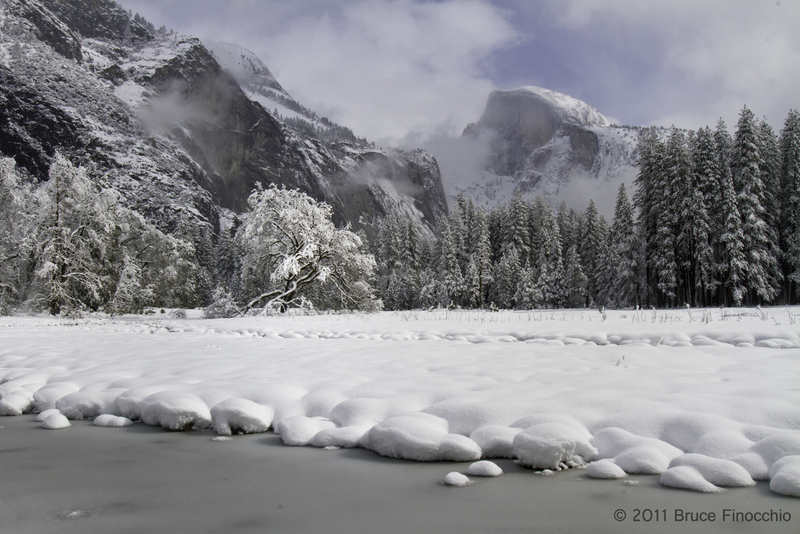 Not place my tripod in the same spot as thousands of others, and avoid creating a commonplace Yosemite image seen many times before. I am not the first to try do this for sure, but I think that the dark ice flows of the river on the top of the image, lead into the falls, giving a painterly feeling that the river flows into the falls, when actually the water from the falls flow into the river. 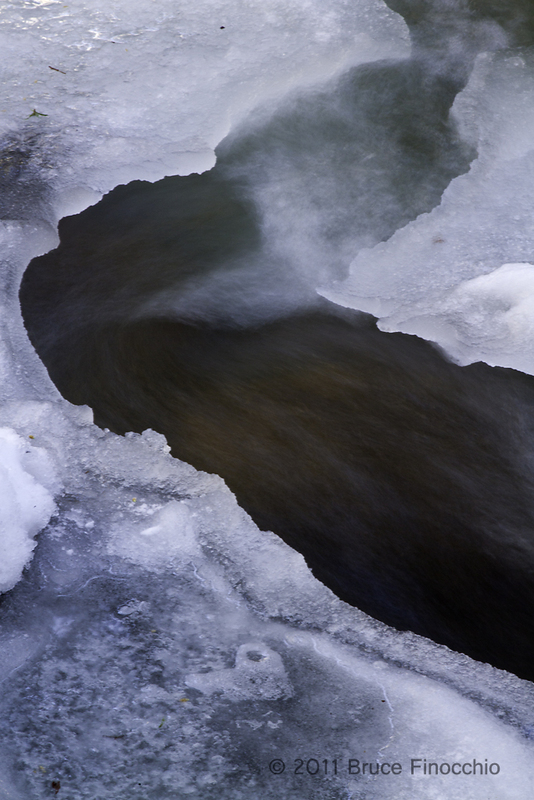 It’s this black shaded river with the chunky ice flows, that lead down into the falls reflected in the river that give this image it’s unique ironic symmetry. The black color is caused by the pine trees along the river; their shadows darkening that specific top image portion of the river. Even the bottom ice flow contributes to the overall success by framing the bottom portion, keeping the viewer’s eye in the photograph. 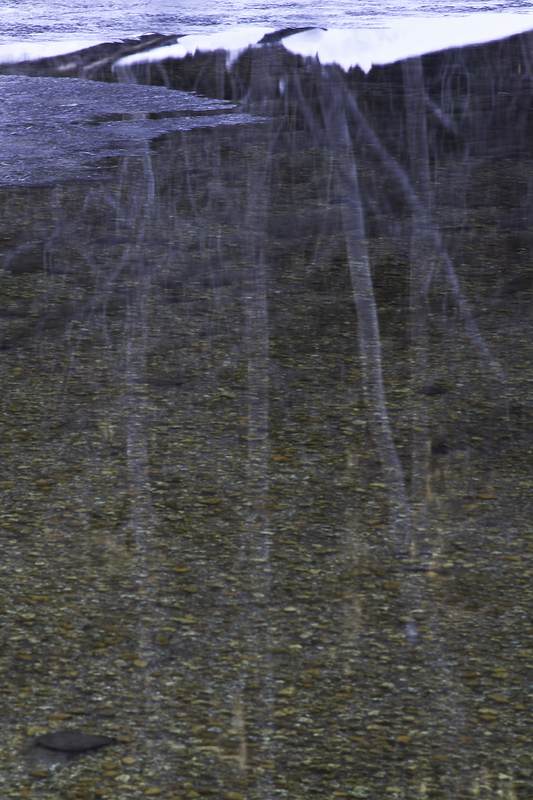 The pine trees shadowing the river, the ice flows in the perfect places, and the reflected falls in a clear space within the river, all at this one moment in my mind’s eye come together to produce a image with power and beauty. Separate your image making from the crowds of other photographers, think about a unique viewpoint, a method that’s different, a different lens choice, an atypical composition, and/or an unusual technique–a wide angle lens for wildlife and/or a telephoto lens for landscape, as examples. Also, think about what you are trying to communicate with your photography. What are you saying with each image you make? How do the various elements within your image contribute and emphasize your visual message? Does your image tell a story? Does it speak a visual language that moves the viewer’s heart? Following these ideas and thoughts will improve your photography, stretch your photographic eye, and most importantly stimulated your right brain to new visual heights. 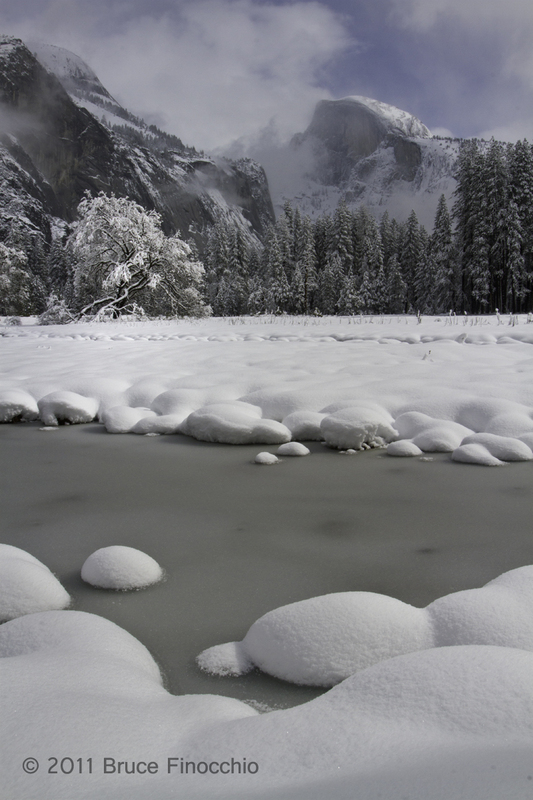 “An Abstract that captures the essence of Yosemite”, commented a fellow camera club member upon seeing this image that dared to be different. 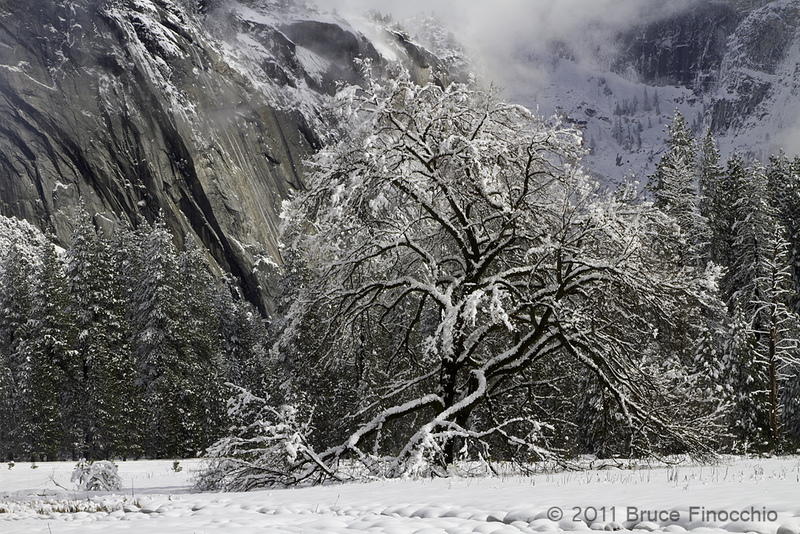 Here is another Yosemite image where I dare to be different: Yosemite’s snow covered cliffs through the black oak limbs, contrasting the solid white cold granite walls, with the dark living tree trunks and branches. 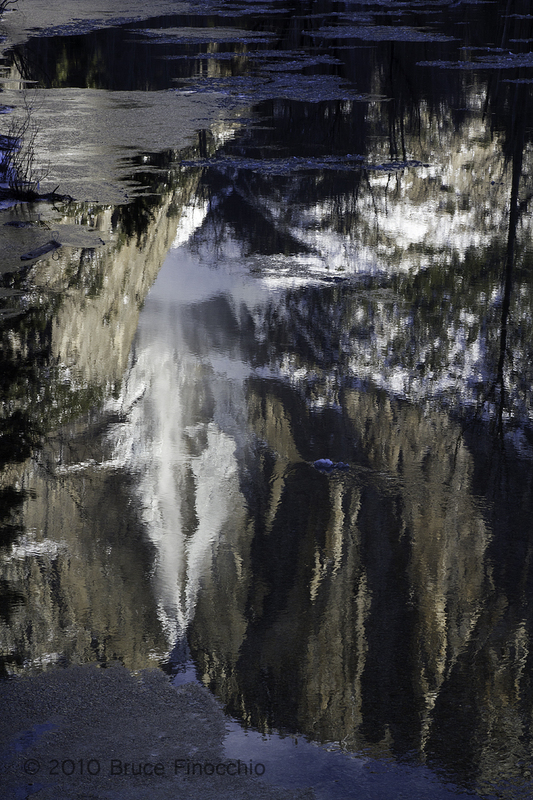 Upper Yosemite Falls from the Swinging Bridge—sky exposure reduced with a 3 stop graduated neutral density filter. 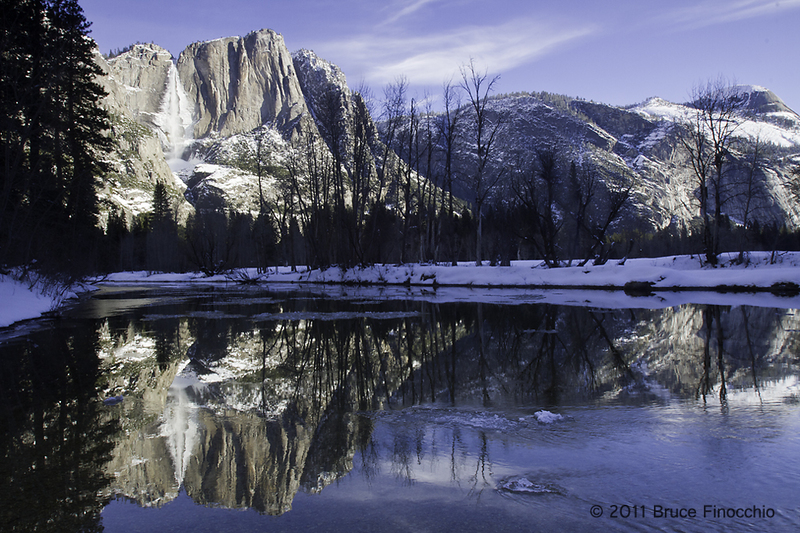 Graduated Neutral Density Filters are an essential and indispensable tool for the Landscape photographer. These filters come in rectangle sheets with gray color on the top portion to clear on the bottom portion of the filter, with an area of less dense gray in the middle. Their purpose is to hold back the brighter areas of an image like the sky, reducing the dynamic range of the image. Since the eye can see a considerably greater range of light than can be recorded by a digital sensor, or film, particularly slide film, these filters help reduce the range of light bringing detail to the shadow areas. Ring type graduated neutral density filers with a half portion gray are not very useful for most situations, since they do not allow placement of the transition. With the rectangle sheet type and a filter holder you can slide the transition to the desired place within the image. Even hand holding the filter you still can place the shaded area precisely where you want; this is not possible with the ring type filter which only has center placement—half and half portions, half grey and half clear. A scene with great contrast and dynamic range, the dilemma is what do you expose for, the highlights or the shadows. A typical scene at sunset or sunrise, where the sky is very bright, expose for the sky, the shadows are typically very dark and hold very little detail. The graduated neutral density filter can equalize or reduce the range of exposure, so highlight areas are not blow out when exposing for the shadows, conversely shadows aren’t black and devote of detail when exposing for the highlight areas. These filters come in various degrees of strength, referring to how dark is the gray section of the filter, and how much light is blocked. This measurement is called stops, i.e. two stops or three stops, with three stops being darker or holding back more light than a two stop filter. Neutral Density filters also have another measurement term referring to how gradual the gray area of the filter fades to clear. For hard stop filter, the area of demarcation is sharp with little or no faded area. Soft stop filters have a much greater area of fade from gray to clear; a much greater transition area for a softer blending effect. Overall, graduated neutral density filters greatly help in reducing the range of light, allowing detail, color, and texture in both the highlights and shadow area within an image. Many manufacturers make these types of filters including Cokin, Tiffin, and Singh Ray. With many variations and intensities, hard and soft stops, reverse type where the gray density is in the middle section of the filter. The larger “P” size filter can also be used as a complete neutral density filter to reduce harsh light areas as well as darkening light colors, increasing color intensity and saturation. Remember; when that grand scenic with a wide range of light is in front of your lens do not forget this indispensable filter. Of course, in today’s digital world, you can create the same graduated neutral density effect digitally, that’s worth a whole another post.